A heartfelt letter from FathersLoveLetter.com. Here are some encouraging scriptures about God’s love for us. 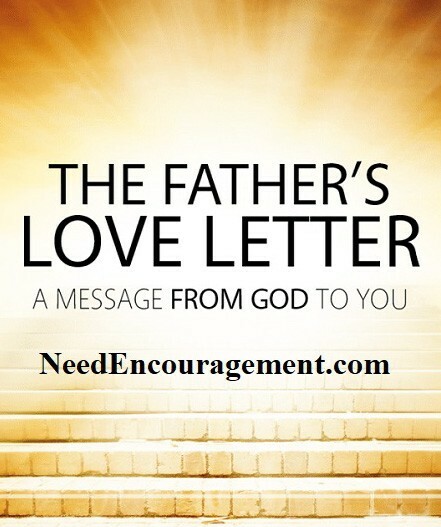 A Beautiful Love Letter From God To You! My Child, (An intimate message from God to you). You may not know me, but I know everything about you. Psalm 139:1 I know when you sit down and when you rise up. Psalm 139:2 I am familiar with all your ways. Psalm 139:3 Even the very hairs on your head are numbered. Matthew 10:29-31 For you were made in my image. Genesis 1:27 In me you live and move and have your being. Acts 17:28 For you are my offspring. Acts 17:28 I knew you even before you were conceived. Jeremiah 1:4-5 I chose you when I planned creation. Ephesians 1:11-12 You were not a mistake, for all your days are written in my book. Psalm 139:15-16 I determined the exact time of your birth and where you would live. Acts 17:26 You are fearfully and wonderfully made. Psalm 139:14 I knit you together in your mother’s womb. Psalm 139:13 And brought you forth on the day you were born. Psalm 71:6 I have been misrepresented by those who don’t know me. John 8:41-44 I am not distant and angry but am the complete expression of love. 1 John 4:16 And it is my desire to lavish my love on you. 1 John 3:1 Simply because you are my child and I am your Father. 1 John 3:1 I offer you more than your earthly father ever could. Matthew 7:11 For I am the perfect father. Matthew 5:48 Every good gift that you receive comes from my hand. James 1:17 For I am your provider and I meet all your needs. Matthew 6:31-33 My plan for your future has always been filled with hope. Jeremiah 29:11 Because I love you with an everlasting love. Jeremiah 31:3 My thoughts toward you are countless as the sand on the seashore. Psalm 139:17-18 And I rejoice over you with singing. Zephaniah 3:17 I will never stop doing good to you. Jeremiah 32:40 For you are my treasured possession. Exodus 19:5 I desire to establish you with all my heart and all my soul. Jeremiah 32:41 And I want to show you great and marvelous things. Jeremiah 33:3 If you seek me with all your heart, you will find me. Deuteronomy 4:29 Delight in me and I will give you the desires of your heart. Psalm 37:4 For it is I who gave you those desires. Philippians 2:13 I am able to do more for you than you could possibly imagine. Ephesians 3:20 For I am your greatest encourager. 2 Thessalonians 2:16-17 I am also the Father who comforts you in all your troubles. 2 Corinthians 1:3-4 When you are brokenhearted, I am close to you. Psalm 34:18 As a shepherd carries a lamb, I have carried you close to my heart. Isaiah 40:11 One day I will wipe away every tear from your eyes. Revelation 21:3-4 And I’ll take away all the pain you have suffered on this earth. Revelation 21:3-4 I am your Father, and I love you even as I love my son, Jesus. John 17:23 For in Jesus, my love for you is revealed. John 17:26 He is the exact representation of my being. Hebrews 1:3 He came to demonstrate that I am for you, not against you. Romans 8:31 And to tell you that I am not counting your sins. 2 Corinthians 5:18-19 Jesus died so that you and I could be reconciled. 2 Corinthians 5:18-19 His death was the ultimate expression of my love for you. 1 John 4:10 I gave up everything I loved that I might gain your love. Romans 8:31-32 If you receive the gift of my son Jesus, you receive me. 1 John 2:23 And nothing will ever separate you from my love again.